How do our customers find us? * resultados actualizados dinamicamente segundo os inputs facultados pelos nossos clientes. Your website on top 10 of the main search engines. There is a blend of science and art in Search Engine Optimization, which leaves very little room for chance. Search engine algorithms are constantly evolving, leading to a constant pursuit for knowledge about them. Our SEO services begin with a thorough and detailed audit to your website’s characteristics Vs. your competitors, identifying which variables contribute the most for the best visibility of your website. ensure website’s visibility, boosting its popularity. JellyCode is a Google Engage partner that delivers knowledge, experience and the resources required to carry out successful campaigns. 60€ are on the house, after you spend 20€ on the first campaign. strategies & supports to promote your website’s visibility. Not everything depends on the code of your website to be more or less search engine’s friendly. The environment (competition, popularity, etc) brings a lot of variables that can influence positively or negatively the website’s positioning. Search Engine Marketing services (SEM) stands for the implementation of marketing techniques and supports to promote the visibility of websites on major Search Engines results. Mainly focuses on external factors to the website, such as: sponsored listings, e-mail marketing campaigns, press releases, social networking, blogs, and other media. 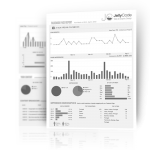 JellyCode offers professional and certified expertise, including cut-of-the-edge technology that offers Audit & Optimization reports for all the main search engines, all over the world. how much it costs to optimize my site?